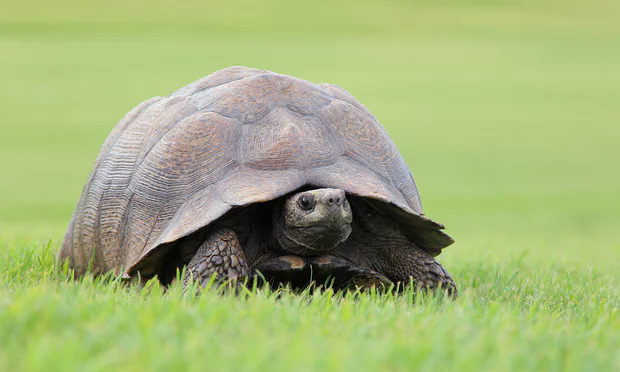 In the 23 years we lived at our old house the tortoise was an undemanding pet: in the summer he stalked the garden freely; in the winter he held the kitchen door open. He’s not affectionate, but he’s quiet. He’s also about 50 years old – my wife has had him since she was eight – and will probably outlive us. When you know you’re going to have to bequeath a pet to someone eventually, the fact that it requires very little maintenance is a plus. Things are different in the new house – the garden is full of seedlings and unestablished annuals, with no raised borders. Left to his own devices, the tortoise will mow through a whole bed in an afternoon. What he can’t eat, he squashes. My wife bought a rabbit run to pen him in, but every moment he’s in it is spent trying to figure a way out. I find this very hard to watch. The intriguing image of the tortoise as a rampaging vandal came back to me as a couple of days later I came across the familiar tale of the playwright Aeschylus’s death by testudo (all right, tortoise) which an eagle needing to crack the shell dropped on his bald head thinking it was a rock. I suppose if that had hit Newton on the head rather than an apple we would never have known about gravity. Death can of course be caused by strange objects though ‘Death by Aubergine’ seemed an unlikely headline. Recently an Australian accused of killing a man on a farm claimed he’d tripped over an aubergine which caused his shotgun to discharge “without the trigger being squeezed”. Apparently the neighbours had been arguing after the dead man allegedly ran over the accused’s dog. Jean-Baptiste Lully had looked set for a remarkable musical career after French King Louis XIV appointed him superintendent of the royal music and music master of the royal family. This was in the days when conductors used a large staff rather than a baton, indicating the time of a piece by banging it on the floor. In 1687, Lully was conducting a Te Deum in celebration of the king’s recovery from an illness, when he struck his foot by mistake. The wound turned gangrenous but Lully refused to have his “dancer’s leg” amputated, claiming he would rather die than to lose his ability to dance. He died two months later. The conducting staff was abandoned in favour of less dangerous methods – rolled up sheets of paper or bare hands, and eventually the baton was setttled on. And the moral of this story – well, there isn’t one really, other than you never know what’s round the next corner. As I always say – mind how you go.